Caribbean and Latin American literature, Afro/Latina/o and Black Diasporas, French Atlantic, Carceral Narratives. Languages: English, Spanish, French. Michael grew up in several cities within the San Gabriel and Pomona Valleys of Los Angeles County, San Bernardino County, and lived various years between the city of Xalapa, Veracruz and the pueblo of Tequila, Jalisco. After finishing high school in Mexico, he returned to California obtained a GED, enrolled in Citrus Community College in the city of Glendora, and transferred to The University of California, Los Angeles where he graduated in 2014 with a B.A. in English and a minor in French. 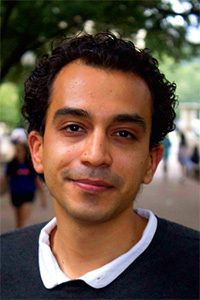 He entered the Graduate Program in Comparative Literature at the University of Texas at Austin in the fall of 2014. His research has been funded by Mellon Mays, Ford Foundation and the Social Sciences Research Council. He is currently a Mellon Engaged Scholar Initiative Fellow.